Female songbirds sometimes raise their young alone, without help from the father - if they have evolved where food is abundant and a female can succeed at parenting alone. But in habitats where a second parent is needed to keep up with the brood's appetite, songbirds have generally evolved to be monogamous, and both parents stick around to raise the young. And not necessarily just for the season; some bird species mate for life. In such cases, a mated pair may use songs to strengthen the pair bond between them, and to defend their breeding territory from rival pairs. But it turns out, avian adultery is not uncommon. Both males and females in mated pairs may have a wandering eye. 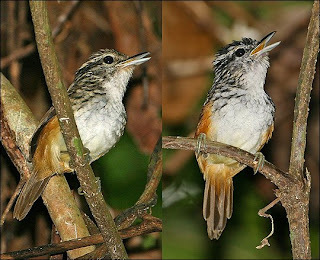 Nathalie Seddon and Joe Tobias of the University of Oxford studied the role of song in the adultery of Peruvian warbling-antbirds. In their latest research, published in the journal Current Biology, they report that an antbird couple will sing a "simple, precisely coordinated duet" when confronted by an intruding rival pair. But if an unattached female enters the scene, the duet begins to break down as the antbird "wife" starts jamming or blocking out the notes of her mate. She interrupts her spouse with her own music, to his great frustration. Said Dr. Tobias, "Males then countered this strategy by changing their songs in an attempt to avoid interference, resulting in a more complex acoustic display." Animal duets are often harmoniously coordinated, but there has been a long-running debate about whether they are purely cooperative, or whether they reflect conflicts of interest. The Peruvian warbling-antbird offers an ideal situation for studying this question because on one hand males and females sing together to defend shared territories, and on the other males sing ‘solos’ as part of attracting a mate. Single females are a threat to paired females because they increase the likelihood that males will cheat on their existing partner, or abandon them in favor of a new one. As it turns out, 'divorce' is common in antbirds. And so, the presence of an unattached female leads to a kind of acoustic battle in which males and females have different priorities. According to Seddon and Tobias, their findings demonstrate that animal duets can be cooperative or manipulative, depending on context. Their study also provides the first evidence that individuals in duets try to avoid being jammed, which can have the effect of increasing the complexity of duets. The research helps to explain the recurrent evolution of complex communication signals in many lineages of birds and social primates, and according the authors may provide a useful clue to the origins of human music. Song of the antbird reveals avian adultery. March 23, 2009. Morning Edition, NPR.